The first site of The Barn on Hess Street North is where it all started for George Love. BARN" width="960" height="588" srcset="http://thespec-stories.com/wp-content/uploads/2015/03/THE-BARN-1024x627.jpg 1024w, http://thespec-stories.com/wp-content/uploads/2015/03/THE-BARN-300x184.jpg 300w, http://thespec-stories.com/wp-content/uploads/2015/03/THE-BARN-200x122.jpg 200w, http://thespec-stories.com/wp-content/uploads/2015/03/THE-BARN-900x551.jpg 900w" sizes="(max-width: 960px) 100vw, 960px" /> The first Barn site on Hess Street North is where it started for George Love. Hamilton Historical Colelction. Loblaws put supermarkets in the news this week, saying it will build 50 new stores and renovate more than 100. 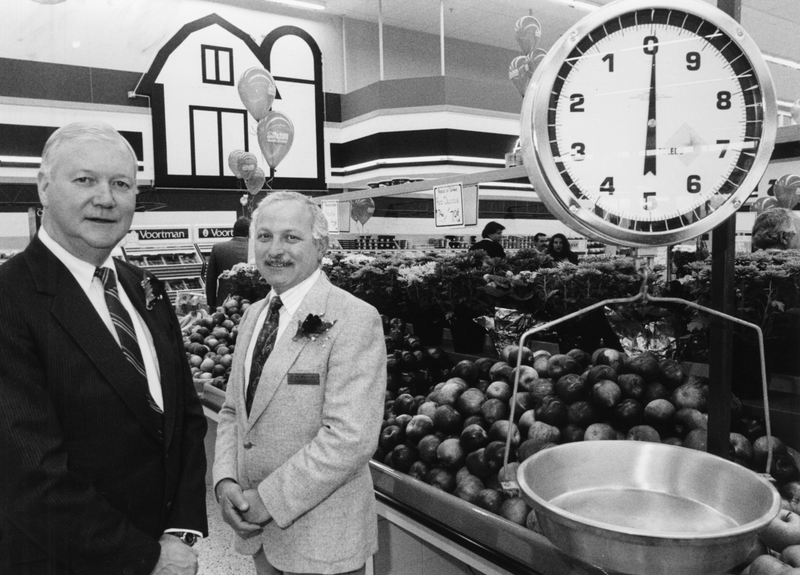 That announcement reminded us of Hamilton’s original grocery empire: The Barn, founded by George Love in 1970. Do you remember? Owner George Love and manager Richard Barone at one of the Barn stores in the early ’90s. Hamilton Historical Collection. The Barn grew out of a Hamilton Farmers’ Market stall into a chain that was gobbled up by A&P in 1999. * 1970: The Barn moves out of the Hamilton Farmers’ Market after it goes indoors. Then a wholesaler, George Love, operated out of two steel huts at Hess and Barton (hence “The Barn”). Retail happened by accident as employees sold ripe bananas to passersby. * 1983: George Love opens his first permanent store on Hess Street North. * 1999: A&P Canada buys Barn Fruit Markets Inc., which includes seven locations and a Burlington warehouse. A price was never disclosed. * 2001: A&P converts five of its Hamilton Super Fresh and Miracle Food Mart stores as well as an Oakville location into Barn format stores, bringing the total number of locations to 13. 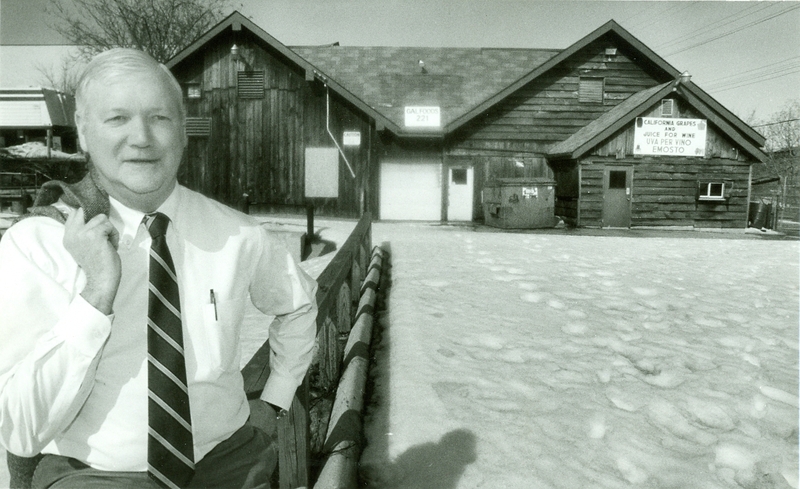 * November 2001: A&P announces the closure of the only Burlington Barn location. * January 2002: A&P announces the closure of the first Barn store at Hess and York, along with a Barton and Kenora location and its G.A. Love Foods warehouse in Burlington. A third Barn store on Rymal Road was converted to a Food Basics. A location at Upper Paradise and Stone Church roads closed earlier this year. * July 19, 2005: Quebec-based Metro Inc. buys A&P Canada for $1.7 billion. * Aug. 7, 2008: Metro announces a rebranding of its chain that sees The Barn and other grocery banners such as Dominion, Loeb and Ultra disappear.  Archived in Flashback and tagged Geroge Love, groceries, Hamilton Ontario, The Barn. Bookmark the permalink. I worked there for twenty three years loved it and miss the stores and the people. It was a wonderful place to work! back in the day formerly known as brenda collins it was 1983 when i was hired at barn four upper wentworth and fennel by richard barone on the spot, 32 years later now known as metro still happily employed thanks for the memories george! Brenda I would love to connect!! I worked there for 22 1/2 years. Great place to work and great people!! George got to know his employees and was a great people person. Cared about us. I was full time for all of those years. When A&P bought it the whole atmosphere changed. So many people were reduced to part time, and then store closings…. very sad when you saw couples that both were FT reduced to PT trying to look after their family and then both lose their jobs!